Sometimes the “pro” reviewers and I agree. Sometimes we don’t, or I may think a wine has been over or under rated. But this wine is one on which everyone agrees. A 2006 Brunello di Montalcino from Uccelliera (Azienda Agricola Uccelliera). If you’re unfamiliar with Brunello, know that it is made from Sangiovese, that same grape that makes for the Chianti you so enjoy. Brunello di Montalcino indicates it is of Montalcino. 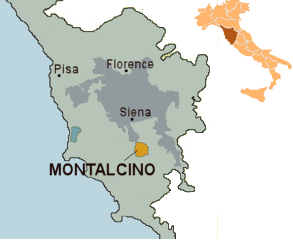 Montalcino is south of Chianti in Tuscany and it is its own DOCG. The climate is warmer, producing grapes that are riper (and with the potential for higher alcohol). Being grown at higher altitude, berries are smaller producing thicker grapes with a higher skin to pulp ratio and, therefore, wines with more tannin. Brunello also has different aging requirements than does Chianti (even its DOCG). These are not wines to drink now. But are they worth the wait? Oh yes! Deep purple in the glass and taking on coppery age tones at the rim, the nose on this Uccelliera is strong with brandied black cherries and fresh-cut, purple plum with a hint of green pepper. The palate is immediately alerted with tart cherry but smooths out soon, and with air the texture becomes pure glycerin. Black cherry develops, notes of dried fruit and sweet tobacco contrast herbaceous hints. Others get strawberry and raspberry. Complex, focused, precise and incredibly delicious. I allowed it an hour in the bottle and another in the decanter and it could have used even more, but didn’t hold up well for the next day despite being vacuum pumped. Nonetheless, a pleasure to experience and next time, I’ll just have to finish the bottle. I served it with a simple green salad, basil-pesto stuffed chicken breasts and a side of zucchini cooked with sweet onion and tomato. (The harvest of my and my friend’s garden calls and I answer). But mostly, I intended to enjoy this wine today and mostly I cooked what I had on hand. As a rule, Sangiovese compliments all such tomato rich dishes and whatever the meal is, it is elevated by Sangiovese. This particular Sangiovese wine lifted it almost out of reach! 90 Points James Suckling, 96 Robert Parker’s Wine Advocate, 94 Wine Enthusiast 93 Wine Spectator. Drinkable 2014-2026. ARP at time of purchase $56 (now $72) found as a close out for $50. Imported by deGrazia Imports LLC (Winston-Salem NC). ALC: 15%.